Aggressiveness, lightness, silence are the main features of this new series of homologated exhaust systems for 50cc scooters. The “Extreme” exhaust is made from a thin iron sheet oxyacetylene welded and is painted with heat-resistant varnish. The silencer is composed of stainless steel end caps and internal core, while the sleeve is in titanium. These features allow the reduction of the weight of this exhaust of the 40-50%, in comparison with the original equipment. In compliance with the European directives, the noise level of the “Extreme” exhaust is the same as that of the stock exhaust, and the improvement of the performance it gives is within the limits imposed. We advise that the variator rolls be changed with the ones we provide with the fitting kit, in order to achieve a better performance in acceleration. This is a line of exhaust systems for enthusiasts. Expressly developed for tuned scooters, these exhausts improve performance up to competition level. The Limited Series represent Arrow’s top products, which are manufactured in limited numbers and are designed for transformed motors with a 70-cc thermal unit and oversize carburetor. They are made using only hand-crafted workmanship, with acetylene-torch welding and manual flanging to make the inner surface of the gas passage more uniform. Instead, the motor and the silencer couplings are welded using a silver-base deposit to ensure a high degree of elasticity. The special sheet metal used for the body is extremely thin and ensures a 70% decrease in weight as compared to the original model. The silencer has solid aluminum end plates and the body is made of a carbon-Kevlar mix that is finished using clear heat-resistant paint. The Limited Series models are ideal for racing since they enhance the medium-high rpm rating range, with a significant increase in maximum power. A new line of exhausts engineered for high-powered four-stroke scooters, finished with polished stainless steel and aluminium. The homologated version for many of the models on the market is also available. The Maxi Scooter range is the latest addition to Arrow’s wide range of exhaust systems and it has been developed taking advantage of the sound experience Arrow R&D has gained in the maxi-moto sector. In this way, we can offer an exclusive line of exhaust kits with an appealing design which assure reliability while improving performance and driveability. These exhaust kits are manufactured with Fe P04 steel plating and it is assembled using M.I.G. welding technique. The sound level has been kept extremely low using an inner mechanical silencer combined with best quality sound proof material. 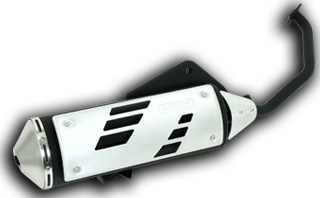 Heat-resistant paint and a functional aluminium front protection complete the appealing design of an exhaust range which will not miss to appeal to the increasing fans of maxi scooters.